Look no further for the best addition to your personal style library in years… this book. “I think part of my success as an editor came from never worrying about a fact, a cause, an atmosphere. It was me—projecting to the public. That was my job. I think I always had a perfectly clear view of what was possible for the public. Give ’em what they never knew they wanted,” said Diana Vreeland of her illustrious career in fashion media. 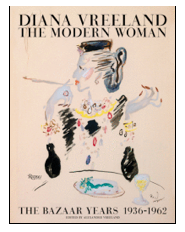 It all comes back to life in the new tome releases this month from Rizzoli (http://www.rizzoliiusa.com) in Diana Vreeland: The Modern Woman that covers Vreeland’s near three-decade tenure at Bazaar. Featured year by year, each annum section opens with all twelve magazine covers before proceeding through a selection of editorial features that best illustrate her innovative perspective and creative working relationships with celebrated photographers such as Richard Avedon, Louise Dahl-Wolfe, Lillian Bassman, Martin Munkacsi and George Hoyningen-Huene. This book shows how her innovative perspective and creative collaborations with Snow and legendary art director Alexey Brodovitch brought American women into the twentieth century. Through images of over 300 pages and spreads from the magazine and commentary from six leaders in today’s fashion world, the book showcases imagery at its best: inspiring, iconic, and timeless.